“Many of the video blogging tools, whether they are live or not, are broadcasting one way,” Le Meur said. “I think this is a mistake. I think we should enable both ways. 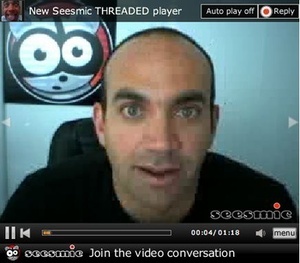 Seesmic, a start-up founded by successful European entrepreneur Le Meur, focused by design on the Web first. Mobile has been in the plan from the start, but it suffers from technological obstacles like slow bandwidth. With 3G coming to the iPhone and Android-powered devices, and with 3G already pervasive overseas on Nokia phones, the time has come for Seesmic to introduce a mobile client so you can record and post new videos or simply view others on a cell phone. “I think it will change the way people interact with Seesmic,” Le Meur said. Seesmic is an odd duck. It’s not “traditional” Web TV like “LonelyGirl 15″ or a ‘Net show produced by Revision 3. It’s mostly average people posting short video clips and commenting on topics started by others, a video equivalent of Twitter. You can subscribe to people, and if they return the favor, you become friends and can keep up with each other’s posts. And yet there is this quality about Seesmic that catches your attention and the next thing you know you’ve watch a half an hour of clips instead of something on network TV or elsewhere on the Web. The clips can be weirdly sitcom, documentary, opinionated, goofy, arcane, and crude but always honest. Le Meur notes that many Seesmic subscribers simply drop by to watch what others are doing and saying and not participating themselves — at least not at first. And soon they will be able to do this on the go.